Backstage at the Sterrebos Festival, The Cure and their manager Chris Parry were interviewed by Oor for their first feature article in this magazine. Oor was established in 1971, inspired by the English and American music press and magazines such as Melody Maker and Rolling Stone, and it still exists up to the present. In the seventies Oor was being published on newspaper format. 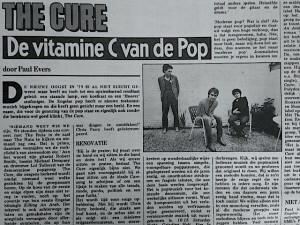 During the eighties and nineties The Cure would be featured in Oor with about one article per year. Below is a translation of that very first Oor article, written by Paul Evers and published in the edition of 22 August 1979. After that, you can read a translation of the review of the two Groningen gigs, published in the local newspaper Nieuwsblad van het Noorden. 1979’s new harvest hasn’t been bad already, but now it has really led to a startling result: a floor lamp, a refrigerator and a hoover. English pop has gained new futuristic music which doesn’t have a face, but an image. And a name which represents the healing of pop music, but actually also sounds quite good without that meaning: The Cure. ‘Nobody knows who we are. 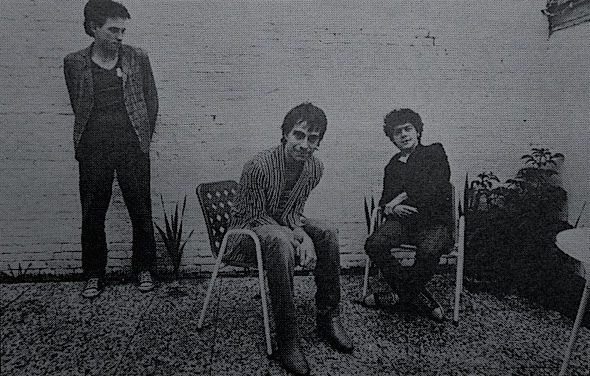 When we played with The Ruts [at the London Lyceum Ballroom on 1 July 1979, LF], we stood in the room watching them and no-one noticed us. That’s just fine, this way we avoid the rock clichés of stardom etc.’ Speaking are guitarist Robert Smith, bassist Michael Dempsey and drummer Lol Tolhurst of the democratic pop group The Cure, that doesn’t get recognised anywhere because nobody knows which faces belong to the band name. 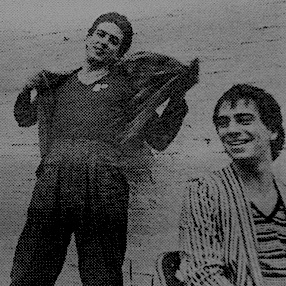 Those faces are not to be found back on the sleeve of the first and only LP, nor on the cover of their first English hit single Killing an Arab. The lyric sheet has also been omitted and for convenience’s sake the song titles have been replaced by various symbols, that in turn correspond with pictures on the back of the sleeve. So, no Smith, Dempsey & Tolhurst, ‘and people are mostly disappointed when they find out that live we are not refrigerators or singing hoovers haha’. Laughter all around, because the boys enjoy the confusion that their non-image has caused. ‘But with us it’s not preconceived as with Gang of Four or Human League or so, you can also use your anonymity as an image. With us it’s more a matter of leaving out our photos on the sleeve just to use another image.’ Then, all of a sudden, a voice raises from behind: ‘Don’t you like it to discover things sometimes?’ Chris Parry has interrupted. It’s time for some clarification. ‘He’ is Chris Parry, who will have his turn later, and the scene looks like this: a tiny bachelor caravan, a Sterrebos [the location of the festival, LF] and a downpour lasting for about three hours. Three exhausted and slightly bored young boys have crossed the stretch between London and Groningen early in the morning on a rainy Sunday, in order to finally plug in at 4 pm in the open air. The Cure in Holland, having performed outside of their native country for the very first time. And all of that because this excellent Sterrebos-manifestation in Groningen has an organizer, who luckily came across the LP with the lamp, refrigerator and hoover in the import crates and decided to contract the group. A wise decision, because the concert of the trio was quite good, in spite of the rain and a bad PA. In a wonderful way, the band creates a tension between simple, predictable pop patterns adopted from the sixties, and unorthodox structures and fragile lyrics, that were being added to this basis. It is pop music for the next decade, which really forms an addition. Because the components from the past are being renovated in a refreshing way, so that innovating music has grown out of it. 10.15 Saturday Night, Grinding Halt, Fire In Cairo, all excellent songs, in which for example the bass guitar stays much closer to the melody than the guitar itself. Chris Parry jumps up from his chair, he’s dying to say something. One moment please, because in ’76 The Cure still exists without him as The Easy Cure. As a five piece, the first songs – mostly Robert’s – are being filled up with covers of Bowie and Jimi Hendrix, whose Foxy Lady in its fifth version eventually has ended up on the LP as a remainder of that period. At the end of ’77, through some campy advertisement, they score a deal with the MOR/disco-label Hansa, who fall for the fresh appearance of the group, but are not that interested in the music. The label refuses to release Killing an Arab, borrowed from Camus’ novel L’étranger, later reborn as a hit, because the good relationship with the oil states may not be disturbed etc. In short, guitarist and drummer move on, enter Parry. For he’s the one who falls for the demo of The Cure, featuring i.a. Boys Don’t Cry (the new single), It’s Not You and Fire In Cairo. At the time he is still working at Polydor, being responsible for healthy agreements with a.o. Siouxsie & the Banshees, The Jam and Sham 69, but he wants to establish a label for himself. With The Cure his Fiction Records has become a fact and so he proudly acts as a manager and mentor of the group. Go ahead Chris, because the idea how to wrap up the medicine is yours. ‘It’s not a non-image or something like that, it’s more that in those days The Cure only existed of their music and we didn’t find it necessary to add faces to that. We thought it would be nicer to carry out a visual idea, which supported their ideas. We wanted to sell it purely on the basis of that image and with that on the music and not on the band. The issue is, that the record has been given an excellent reception in the English rock magazines, but has been attacked by NME’s Paul Morley on its supposedly pretentious packing. Parry retorts: ‘It doesn’t have anything to do with pretension or obscure, it’s just another way of presentation and not revealing everything right away.’ He believes in ‘his’ Cure, to become one of the bands in the forefront of a new platoon. ‘This group doesn’t fit into anything, not in the punk camp, not in the mod-camp, neither in the ‘new music’ camp.’ The boys joke and chuckle and in the end they come over more naturally than the calculated cover suggests. Although the signature on the sleeve is being passed on to the fan with a slight cynicism. 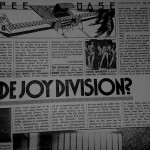 In the same Oor edition of 22 August 1979, Unknown Pleasures, the legendary debut album of Joy Division, was being reviewed. The review starts with ‘This is one of the most moving, compassionate and humane records of recent time.’ It ends with ‘A must-have, though it’s not pleasant’. (…) As to creativity, particularly the performance of The Cure was important. The company had flown in from England especially for their continental debut at the Sterrebos and had to experience in Groningen how circumstances can be a spoil-sport. In particular since the first LP “Three Imaginary Boys” and a couple of not yet in the Netherlands released singles, in England The Cure is being considered as part of the top of the new developments in pop music. During the set they performed at the Sterrebos, which was very short from sheer necessity, the group could not yet confirm that status. 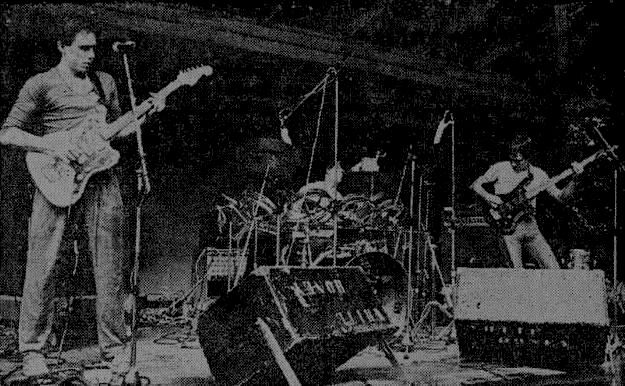 How much circumstances had influenced the performance of The Cure only appeared at the Groningen centre Simplon in the evening, where an extra concert was being organised in a hurry, to give the Cure-presence in Groningen a bit more cachet. In this extra concert, which still attracted a couple of hundred people after the announcement at the Sterrebos, The Cure proved to be very convincing. The group consists of three men (guitarist-singer Robert Smith, bassist-singer Michael Dempsey and drummer Lol Tolhurst) and only for that reason there can be made a comparison with The Police. There is also a musical resemblance: The Cure essentially makes very rectilinear rock music as well, which due to exceptional structures and an often not very usual build up of the songs still sounds very refreshing. Then again, a difference with The Police is that the The Cure’s pace is much faster and their music is put together more venomous. At Simplon the group made an extraordinarily strong impression, even if the control of their instruments left some to be desired. 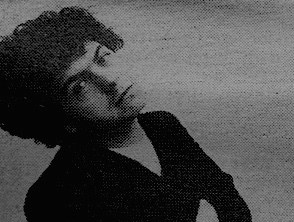 Different kinds of musical genres were being intertwined by The Cure into a surprising sound, in which the peculiar rhythm guitar style of Robert Smith, his airy voice sound, Lol Tolhurst’s obstinate drum style and Michael Dempsey’s spasmodic bass work were notably being absorbed into a coherent totality. Some great photos of The Cure Groningen 1979 gig made by Rudi v.d. R. can be found on Cure-concerts.de. They also played later in the evening at a local youth club, but none of them can remember what happened, except that it was good. Such is the nature of life. Or something. On 29 July, The Cure played an open air festival in Sterrebos, Holland, their first trip abroad as a band.